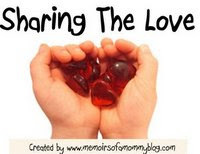 Thanks to Lynn for sharing this sharing love tag. It's nice to share of what you have, it means you love the person that you share with. Now, it's my turn to pass this tag to all my friends online. I hope you will grab this tag and share this to others too. This award is extra special because Crystal created it in honor of the donor who saved her son's life. Her son Noah had to have a heart transplant when he was just over a month old. This award is supposed to help raise awareness of the importance of organ donation. As you may have recently seen on my side bar, I have finally created a custom blog award!! I have wanted to do this for a long time but never came up with something that “fit”. I didn’t want just anything. It had to be something that meant something to me. And what could mean more than Sharing the Love by giving you pieces of my heart?? So I created this award in Honor Of The Donor That Saved Noah’s Life. I share this award with those of you whose love and friendship have enriched my life and made my world a better place.